Students take this Add with Pictures- up to 10 Math Test to review and check knowledge about adding sums up to 10 by counting pictures or adding numbers. This test has cheerful and fun pictures. It's presented in the form of multiple choice questions. There are several ways of approaching this interactive test. Students can count the pictures or they can add the numbers. 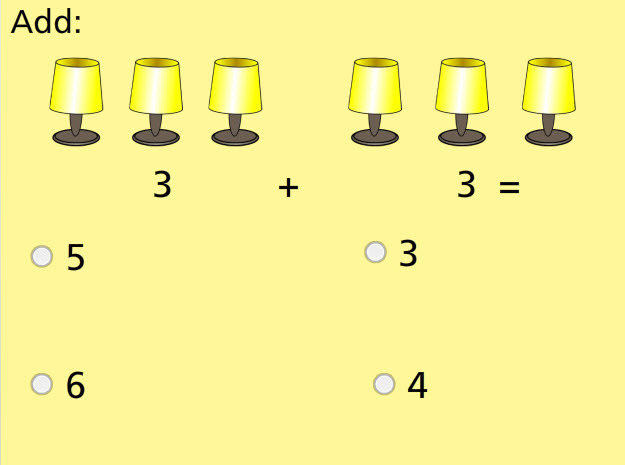 Return from this Add with Pictures- up to 10 Math Test to the Elementary Math Tests, Kindergarten Math Tests webpage, or to Math Tests.